I was never really into Halloween decorating until I moved into our current neighborhood. In our townhouse, we always put out pumpkins and passed out candy to any trick or treaters that came by. When we moved into our current house, all that just seemed to be way too low key considering all the decorating that was going on around us. So, slowly, we’ve been accumulating decorations at the after holiday sales to add to our collection. 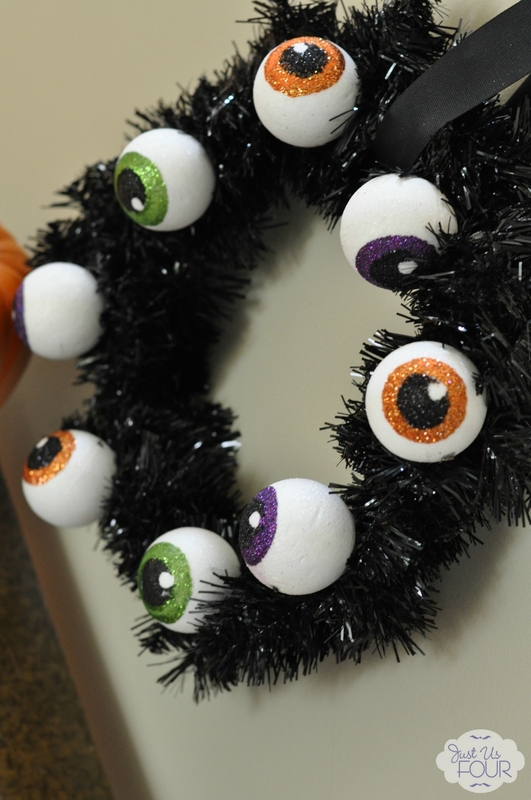 Of course, it helps if you can make some of your decorations too so I created this spooky eyeball wreath this year. This wreath really came about as I was shopping for fall decorations and they were starting to move the Halloween stuff onto the clearance aisles. 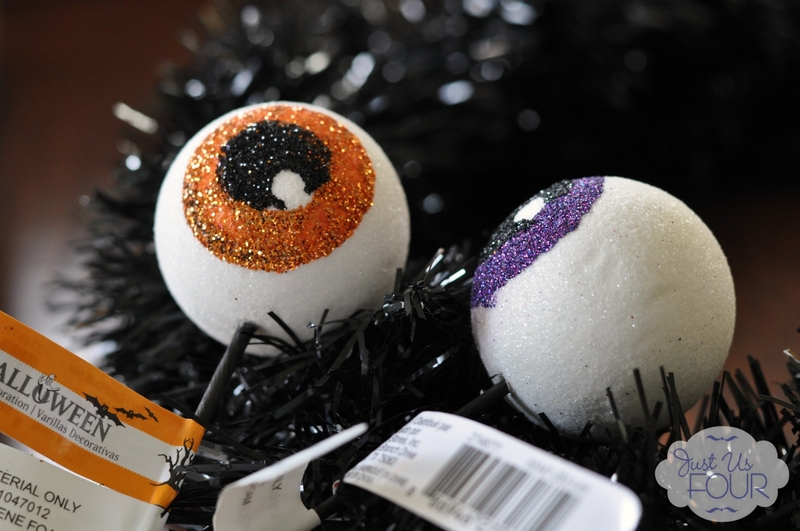 Of course, this was August so I was barely thinking of Halloween yet but I managed to snag a bunch of styrofoam eyeball picks in purple, orange and green. I stuck them in my cart figuring I would find something to do with them even if it was nothing more than shoving them in a vase. 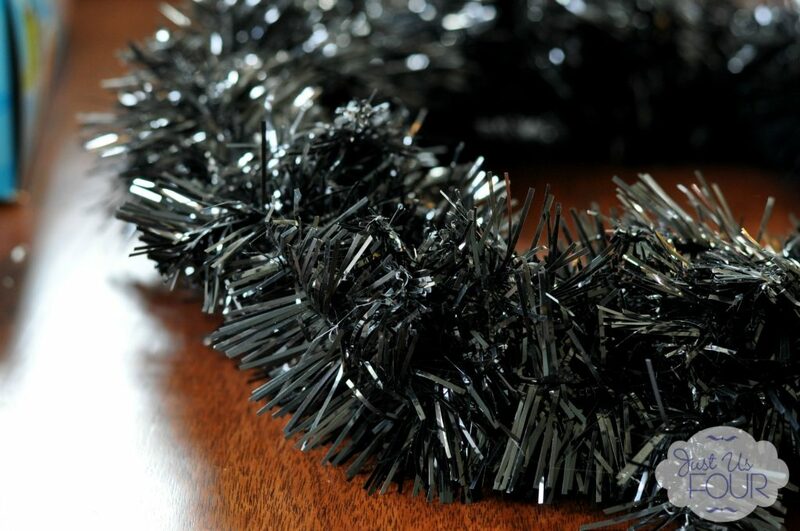 I turned the corner and saw the black tinsel wreath and knew immediately what the eyeballs would be used for! I’d love to call this a tutorial but really, my 6 year old could have figured out this wreath with no instructions so I won’t insult you with writing out steps. 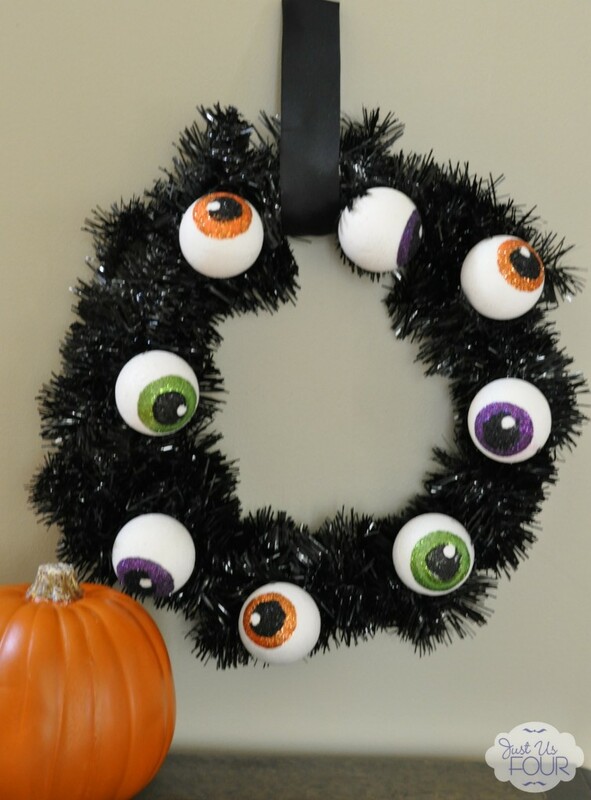 Basically, just glue your eyeballs wherever you want them on the wreath. 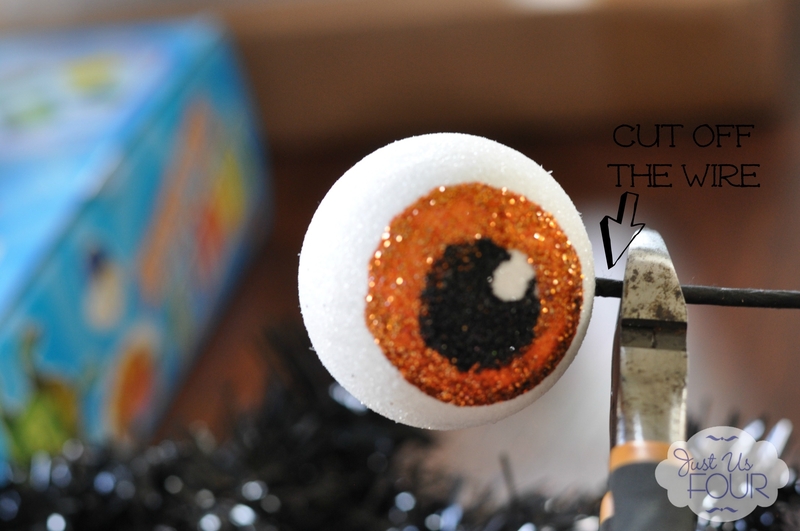 Oh, be sure to cut the stick part off each eye ball with wire cutters before you start gluing. You can find this post shared at the list of fabulous parties found here. I love this creepy cute wreath! Thanks 🙂 I was looking for something super fun for Halloween. Thanks! I thought it was super fun. Thanks so much for featuring my wreath! I think it is just a fun little wreath for Halloween. Can I ask where did you find the eyes? The eyes were little floral sticks that I found at Michael’s crafts stores. I love this wreath! It would make a great addition to anyone’s front door for the Halloween holiday! Thanks! I love how it looks on the door. I will definitely come by for a visit. Thanks! We had fun putting it together. Thanks! I had fun putting it together. Cool wreath! I love the eyes and the different eye colors, especially the green and purple. Thanks! I had fun picking through the different colors available. Oh, lol, this is just TOO adorable!! Thanks! 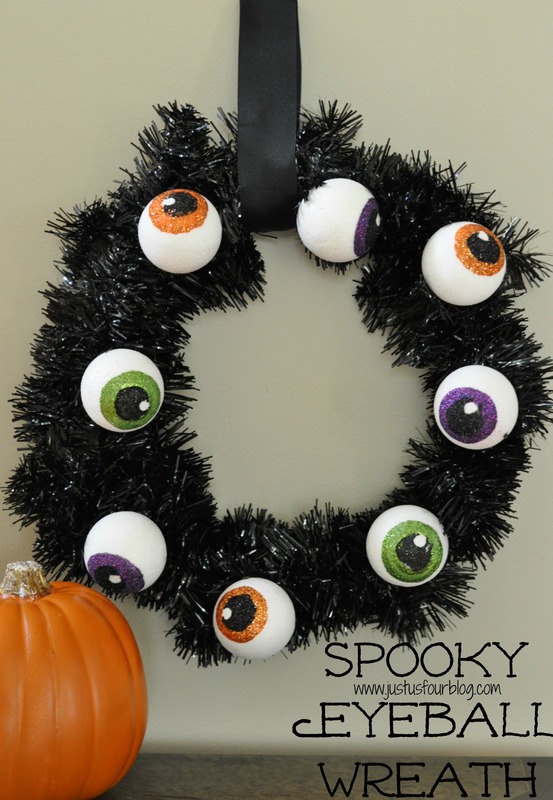 I realize looking back it probably isn’t very spooky unless you are 6 years old but I still think it is a fun wreath. Thanks so much for the feature! I look forward to Monday Funday every week! Thanks so much! I will stop by for a visit. This is really cute! I pinned it for you, too!